Source Point Press Blurb – Welcome to the bloody big top! Writer Mira Mortal and artist John “JAR” Rodriguez present this one-shot graphic novel that puts a fresh twist on zombie-horror and takes “wigging out” to a whole new level! A complete side-show of gore, suspense, hilarity, and circus pandemonium! Anyone who knows me, knows I am a sucker for a horror story that is smart, offbeat or at least has a fresh take on the genre… that being said, I fell hard for this new book from author Mira Mortal and artist John “Jar” Rodriguez, which is all three. 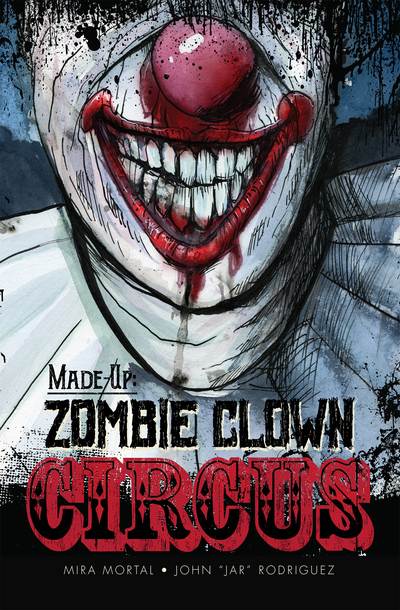 Zombie Clown Circus, like any other good horror adventure tale, jumps right into the action and then moves at full force while daring the reader to keep up. ZCC is both smartly written and precisely focused. Ms. Mortal piques the reader’s interests within the first two pages and then continues to keep it in a vice grip until the end of the book. In many ways, the smaller story lens of ZCC reminds me of some of my other fav zombie yarns. Readers aren’t burdened worrying about a world-wide epidemic nor a city-wide disaster, not even where the toxic ingredient comes from – instead the readers are emotionally invested about a small group of circus performers turned survivors as they escape from the horde of deadly clowns. While you may think that the zombie genre might have been played out, Mira Mortal proves that a talented writer can go where others have already been and can weave an amazing story where others leave tripe. There is nothing but freakin’ Awesome Sauce here! John “Jar” Rodriguez proves that his talent runs wide and deep with this project. While I have been a fan of his work for a while now, his work in ZCC shows his expert ability to do both a close up portrait and wide-angle action – and everything in-between. His line work, coloring and flowing style are all perfect for this project. While he can tell the story of the an entire scene on a page, he also has the ability to translate both action and emotion within a single frame. Last but not least, while there are many things I am geeking out about this book, one of the most brilliant is the page layout. The truth of the matter is that page layout can enhance or kill a story. In the case of ZCC, the brilliant layout choices sets a perfect stage for both incredible art and a wonderfully wicked story! The Bottom Line – Preorder it NOW! You can thank me later – HERE!